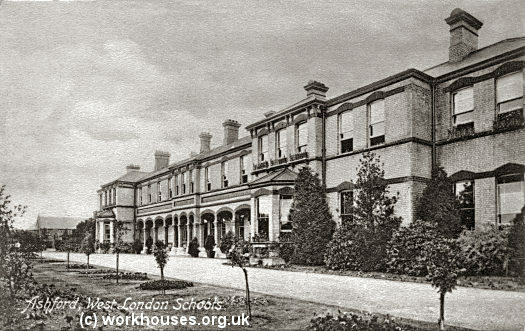 The West London District School at Ashford, Middlesex- a residential school for workhouse children. The West London School District was formed in 1868 and covered the London Unions of Fulham, Hammersmith, Paddington, St George, Hanover Square (1868-1870), and City of Westminster (from 1913). The School District Board first met on 2nd April 1868, and on 9th October that year accepted the plans of HH Collins for a school for 800 children. 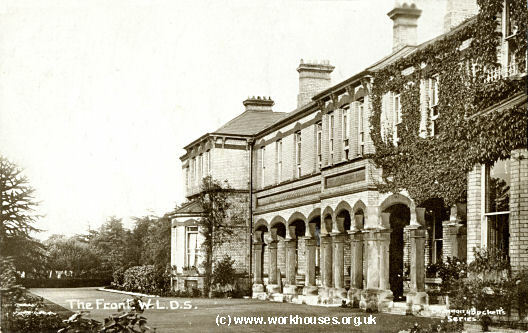 The school was built in 1869-72 at the west side of District Road, now Woodthorpe Road, at Ashford near Staines. 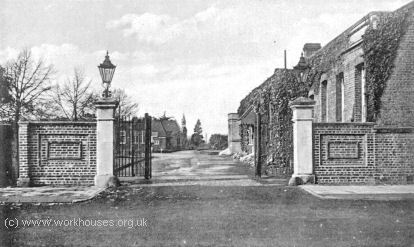 Ashford School — District Road entrance from the east, 1930s. The main building comprised a large central administrative block with long narrow wings to each side, one for boys and one for girls. The site location and layout are shown on the 1935 map below. West London District School, Ashford, c.1914. West London District School, Ashford. A chapel was located at the eastern end of the main building. Ashford School — main building from the north-west, with chapel in distance. A boiler-house, laundry and farm lay at the south of the school, and an infirmary to the south-west. 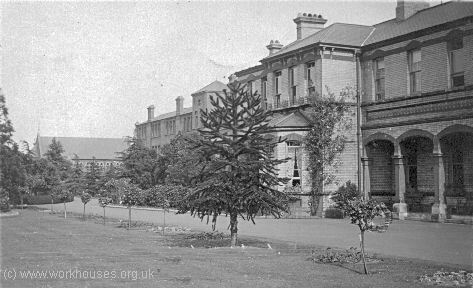 Ashford School main building from the north, 1931. In 1930, the site was taken over by the London County Council. The school was finally closed in 1955. The buildings have all been demolished and there is now modern housing on the eastern part of the site. The remainder is occupied by HM Prison Bronzefield, a purpose-built and privately-run women's prison opened in 2004. Minutes, agendas, reports etc of Board of Management and various committes; Annual reports; Financial accounts; Correspondence with central authorities; Admission and discharge registers; Registers of apprenticeships; Returns and statistics of children in care; Timetables and syllabuses; Dietary tables; Medical Officer's reports; Issues of school magazine; Staff records; Building plans of Ashford School and Park School; Photographs.